The Missouri Mesonet was created in 1992 to support high technology agriculture and preservation of the environment. With technological advances the network has expanded to benefit many other sectors over the years. 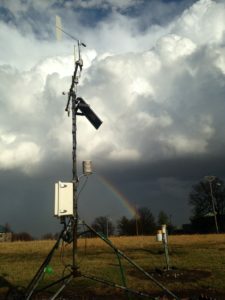 The network is an important economic and environmental data resource that provides real-time weather monitoring and historic climate data in the interest of public safety, risk management, research, education, decision making, tool development, and assessing trends and changes in our climate. These beneficial qualities provide useful and valuable information for Missourians, for our country, and for our world. Stations are primarily located at University of Missouri Agricultural Experiment Station Research Centers, with several stations also located on K-12 school property and private farmland. All sensors and components are purchased through Campbell Scientific, Inc.